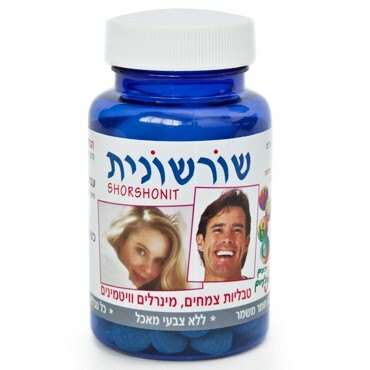 Herbal, Mineral and Vitamin Tablets for Strengthening Roots of the Hair and Preventing Hair Loss. Contains: Urtica Diocia (Stinging Nettle), Wheat Sprout (a source of vitamin E), Rosmarinus Officinalis (Rosemary), Cellulose, Zinc (Zn), Calcium (Ca), Vitamin B1, Vitamin B6. It is well known that one of the causes of hair loss is a shortage of vitamins and minerals like: Zinc, Calcium, Silica and vitamin B. The consumption of these minerals and vitamins aids in reducing hair loss. In addition to the vitamins and minerals, "ROOTS" contains a unique formula from the herbs: Urtica , Wheat Sprout (which is a natural source for vitamin E) and Rosemary . This unique formula improves the absorption of the minerals and vitamins in the body and in so doing it contributes to the strengthening of the hair and reduces hair loss. Wheat sprout is a natural source for vitamin E and functions as a natural anti-oxidant. Direction for use: 1-2 tablets a day, 1 hour before a meal.